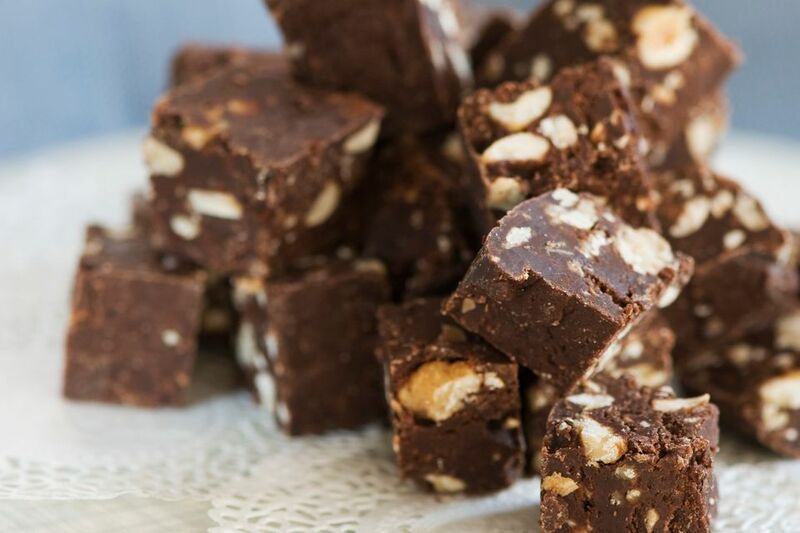 If you are having problems with your fudge, it is most likely a recipe for old-fashioned fudge—fudge cooked to a specific temperature, cooled, then beaten until thick. If not made properly, old-fashioned fudges can be too soft, too hard, or unpleasantly grainy. Not to worry—there are a few methods to fix these fudge problems and tips you'll need to avoid them in the future. These tips do not apply to "quick” fudges that use marshmallow cream or condensed milk and do not require beating. Those recipes are more foolproof and typically do not have the same problems as old-fashioned fudge. Fudge that is too soft retains its unfortunate texture even after having been refrigerated or allowed to sit for long periods of time. It will be sticky, difficult to cut, and will not hold its shape very well. Fudge usually behaves this way for one of two reasons: It was not cooked to a high enough temperature (due to oversight or a faulty candy thermometer) or it was not beaten enough. Scrape the fudge back into a saucepan and add 1 1/2 cups of water. Place it over low heat and stir until the fudge has dissolved and is blended with the water. Increase the heat to medium and bring it to a boil, washing down the sides of the pan frequently with a wet pastry brush to prevent sugar crystals. Cook it to the proper temperature specified in the recipe, and carefully taste the mixture. You might need to add more flavoring, as the old flavor will now be diluted. Once it reaches the proper temperature, you can follow the instructions for cooling and beating the fudge as before. During the beating, remember that you want the fudge to lose some of its gloss and thicken noticeably before you pour it into the pan. It is possible to save overcooked fudge in a similar way, although this method does not always work. If your fudge is too hard or grainy, you can follow the directions above, adding the water and cooking as directed, to essentially redo your fudge. If your fudge was burnt the first time, this method will not work. The burnt flavor will stay with the fudge, so it's best to start from scratch. Before your second attempt, it is a good idea to test your candy thermometer. Simply place it in boiling water and making sure that it registers 212 F. This will tell you if your thermometer is accurate, and prevent you from accidentally overcooking your fudge due to a bad thermometer. During the beating period, remember to stop beating once it starts to become difficult to stir. Fudge can easily go from “perfect” to “rock-hard” if it's over-beaten. If your fudge was not chocolate-based and was originally fairly light in color, you might notice that the recooked batch is darker. This is the result of the sugar being more caramelized, but the texture and flavor should be unaffected.